”The fast-rising, hard-charging, 20-something, North Carolina born-and-bred singer Nikki Hill has more than earned her evocative ‘Southern Fireball’ moniker.” — LA Weekly. Vocal powerhouse Nikki Hill can deliver it sweet and luscious or raw and gritty. Her band, dubbed The Pirate Crew, play a no-holds-barred blend of American roots music—Stax soul, bent rockabilly, bop, southern gospel, even punk—with tight, driving rhythms. Hailing from Durham, North Carolina, Nikki began singing in church as a child. A stint living in nearby college town Chapel Hill introduced her to many different styles of music. Before long she hooked up with guitarist Matt Hill (now her husband and bandleader) and released a self-titled EP in 2012, a dance-ready collection that immediately created an underground buzz. 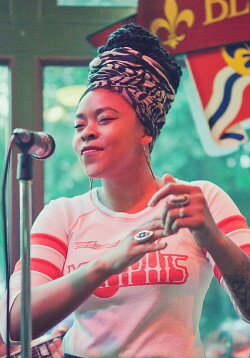 Hill’s debut full length, Here’s Nikki Hill, was released in 2013 and led to worldwide tours, including a stint at this year’s Tulsa Roots Rocks the Green. Bring your dancing shoes for this one.